What are some common gender stereotypes? Shenouda says our society has lots. Girls wear makeup, paint their nails, and have long hair. Boys don’t. Boys like all sports; girls don’t. Girls play with dolls; boys don't. But one of the most sinister stereotypes out there is this: boys are good at math; girls aren’t. Surprisingly, research has shown that children begin inculcating gender sterotypes at an alarmingly early age. According to Shenouda, by one and a half to two years, “Certain behaviors are associated with men and women.” For instance, kids are surprised to see a man putting on makeup or doing stuff in the kitchen. 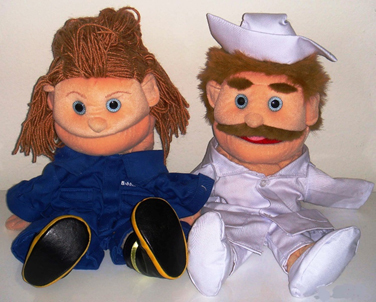 To discover the answer, she did a fun study with 3–5 year olds using two puppets, a nurse and a mechanic. 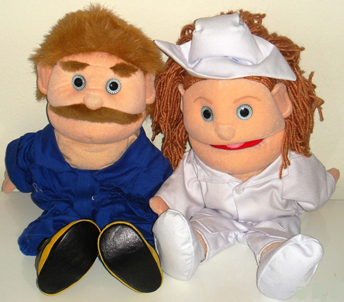 For the first group of kids, the puppets were consistent with stereotypes: the woman was a nurse, the man was a mechanic. In addition to wearing the appropriate outfits, the gender of each was clearly defined. For instance, the mechanic puppet was wearing a mechanics outfit and was clearly male; he had short hair, a moustache. First Shenouda asked job-related questions, like, “Who would know more about how to fix a flat tire?” and “who would know more about how to take your temperature?” However, she also asked about other areas not associated with the job, such as interests or pastimes. Some questions were about neutral activities, like watching TV; others were about activities typically stereotyped as more for men or for women: sports, arts and crafts, etc. “It’s scary, in a way, right?” Shenouda observes. And it also sounds rather like Pavlovian conditioning. She adds that this subtle brainwashing is also true of other stereotyped groups…such as African-Americans who are often stereotyped as not being as intelligent in general as other races. 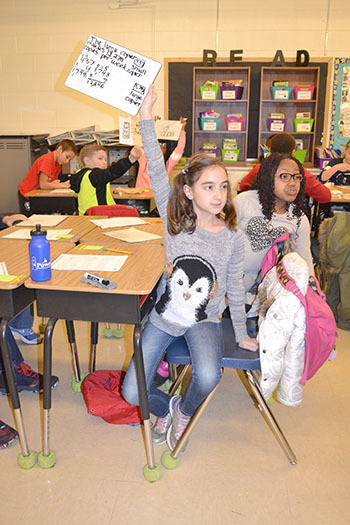 Two fourth graders ready to share their answer. For one group, the researchers activated their gender identity by giving them a picture of a girl holding a doll. Researchers activated the ethnic identity of subjects in the second group by giving them a picture of Asian kids playing with chopsticks. The third, the control group, they gave a picture of trees, which activated no stereotype at all. What were the results of the study? Girls whose gender identity was activated did the worst; girls reminded of their ethnic identity did the best; girls in the control group (given the picture of a tree) scored in between. Shenouda admits that there may be an innate gender difference regarding spatial skills because studies done with 3-months-olds have shown a slight difference. But while there might be a slight difference starting out, Shenouda believes we exaggerate it by the kind of toys we give youngsters. Lego designs Shenouda had 4-year-old girls assemble as part of her study. So she did a study with 4-year-old girls, giving them pictures of either a girl holding a doll or trees to color. Then she had them assemble a specific Lego design and would time them. The girls who colored the girl with the doll were slower than the girls who colored the trees. So we’ve learned that this insidious seed—the notion that girls aren’t good at math—gets planted and starts to grow at an early age. But how does it get planted, and who does the sowing? Shenouda claims toys are one of the culprits and that toy manufacturers are partly to blame, in that their perception of who their market is and the types of challenges boys can overcome in comparison to girls have been shaped by—you guessed it—gender stereotypes. Think about the images plastered all over construction toys’ boxes—they’re mostly pictures of boys, not girls. 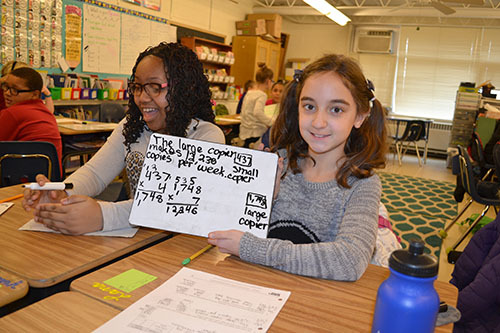 A fourth grader works at solving a problem. Family budget issues aside, her bias against pink Legos is not unfounded. She originally used primary-colored Legos for certain tasks during her dissertation research, but then wanted to switch to pink to “see if the girls, once they see pink, feel like, ‘This is for me; I can do this!’ But I couldn’t find all the parts in pink and purple Legos,” she grumbles. “And I looked at the sets, and they all seemed much simpler than the ones that are more blackish-blueish, presumably for boys.” In other words, toy designers had said, “This is for girls; we shouldn’t make it quite so challenging. They probably can’t get this, so we’ll make it less complicated!” which just compounds the gender stereotype issues for girls. In addition to toys, Shenouda believes another possible source is children’s books. In order to make books something kids can relate to, children’s authors tend to put the book’s protagonist into the middle of a dilemma based on stereotypes depicting middle school as terrible: “But I feel like they plant the seed in kids’ minds that this is what things should look like or what to expect,” Shenouda explains. But although toys might play somewhat of a role, Shenouda claims the two biggest suspects are teachers, and especially parents. 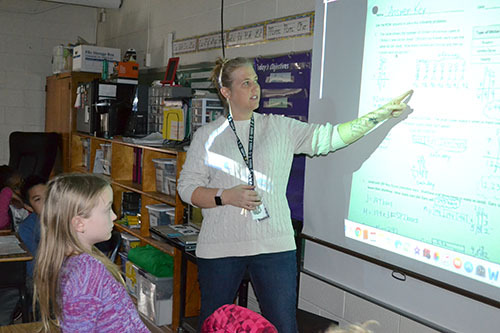 “There are studies showing that kids’ perception of and self- confidence in math is more affected by their parents’ expectations than it is by their own performance,” she asserts. In regards to the stuff teachers and parents do to foster the “girls-are-bad-at-math stereotype, “It’s really subtle. It’s not intentional; they don’t specifically say, “You’re a girl; you can’t do this,” Shenouda says. But she shares some scenarios illustrating how it might happen. Perhaps a girl is doing well, but senses that her parents believe her brother is going to do a better job on math than she does. So her parents encourage her brother when he gets a good grade in math, or when he’s struggling, tell him, “You can do this problem; I know you can do it!” However, they tell her, “It’s ok; you like history as well,” when she doesn’t do as well in math. 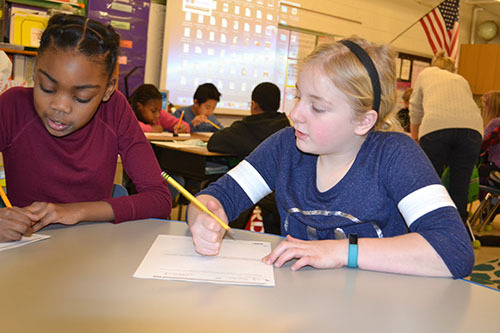 Two fourth graders work together to complete their worksheet. How else do parents and teachers contribute? “You’re so smart!” is a phrase teachers, parents, and even grandparents (mea culpa!) use to praise or affirm children. Shenouda says that, according to research, it’s a no-no. She goes on to explain about a fixed mindset vs. a growth mindset. Girls’ self-confidence as they mature is another issue. For instance, around 4th grade, girls start to become less self-confident, which has a bearing on how this article actually came about. Regarding self-confidence, Shenouda says girls typically have more issues with it than boys do, especially prior to and during the teenage years, when they become more aware of things like body image and how they look. This lack of self-confidence can affect areas they had previously felt they were good at. While it doesn’t usually effect their performance yet, it does effect their self-confidence. 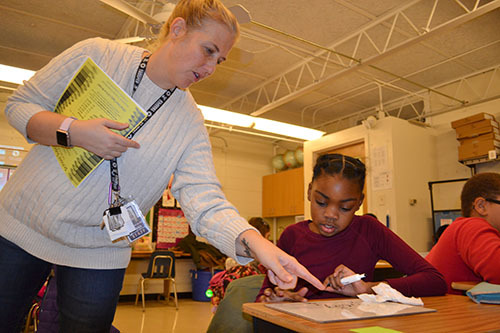 Above and Below: Ms. Alves teaches math to her students. Who/what else might help to foster gender stereotypes? Schools and, obliquely, teacher education programs, may also unwittingly be playing a role. For instance, teachers in younger grades are predominately female; however, math and science, or the more difficult math and science sections in middle school and high school are predominately taught by men, which sends a subliminal message about females’ ability in math. While Shenouda assigns some blame to teachers, she acknowledges that her field is also somewhat responsible. “Researchers do not do a great job at sharing all they know with teachers,” she admits. “There’s this gap of, ‘We know all of this about teachers!’ but then the teachers don’t know.” So teachers miss out on much of the information researchers uncover. What can be done to enlighten teachers regarding gender stereotypes they’re propagating? For one, the teachers who teach the teachers (teacher preparation programs) should be made aware. Another piece of advice for teachers, including pre-school teachers? “Be mindful of what kind of messages you are sending to boys and girls…What teachers do early on affects girls and boys and can have a long-term effect,” she warns. 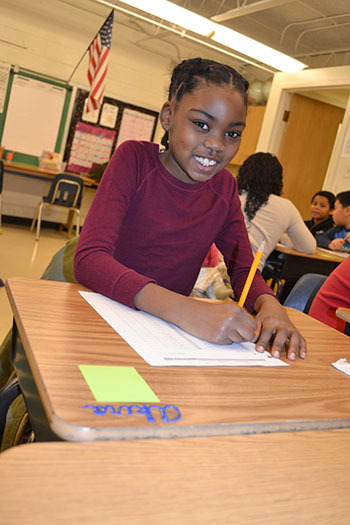 A fourth grader eagerly showcases her answer. Regarding pre-school teachers’ long-term influence, Shenouda shares about a day-care study with 1½-year-old kids. Teachers responded to girls more when they were speaking softly, but didn’t respond to boys until they were angry, whining, or crying, which, of course, encouraged the boys to behave more aggressively than the girls. In this longitudinal study, a year later, the boys were more aggressive and the girls were more gentle when asking, because the teachers hadn’t been responding until the boys became aggressive. In a similar vein, Shenouda alludes to another dangerous trend: schools that separate girls and boys due to the belief that they learn differently and hear differently—that girls need to be spoken to softly and boys need to be shouted at. She also cautions parents: “Don’t automatically assume that if your son or daughter does something specific, that it’s because of their gender. For example, if a boy is doing something that happens to be masculine, don’t be like ‘Oh, it’s because he’s a boy.’” She claims that parents often make assumptions regarding what their child can do based on their gender, which she calls a feedback loop that sets certain expectations for their kids. 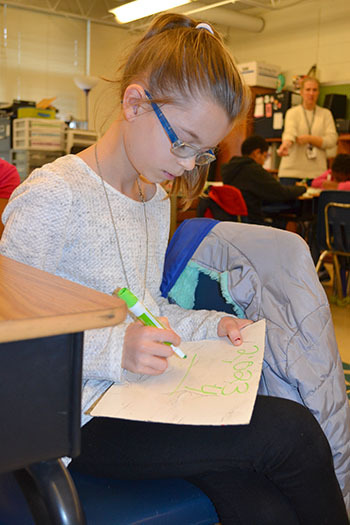 A fourth grader in the midst of the problem set. In the face of such dismal prospects regarding girls and math, Shenouda says there’s good news. “There are no differences between boys and girls in school performance in math and science, at least until high school, where differences show up on standardized test performances, such as ACT and SAT” (which she claims is another issue altogether). But here’s the bad news. 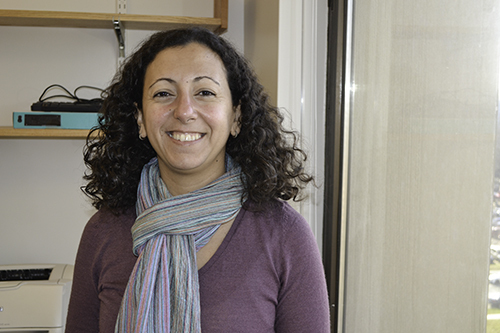 Shenouda says gender stereotype threat does play a key role in terms of her other focus: girls’ interest in math. “Where there is a difference is in the interest part,” she admits, “so the girls do not identify with science and math fields as much as boys do.” Even among boys and girls who perform equally well on math, “The girls do not identify with math fields as much as boys do,” she adds. “They don’t feel like it’s a field for them.” Which means that despite society’s need for more workers in STEM fields, girls are less likely to choose careers in those fields. While Shenouda has painted a somewhat bleak picture regarding how gender stereotypes impact the number of women in STEM, Shenouda says we should take heart. “There has been a lot of progress, we shouldn’t ignore that. If we think about STEM fields 50 years ago with women, it’s a completely different world. We know so much more now, and that knowledge shouldn’t discourage us, it should empower us. But now we know, and we need to keep moving forward. We are doing a great job, so I think we should be optimistic that things are only going to get better. 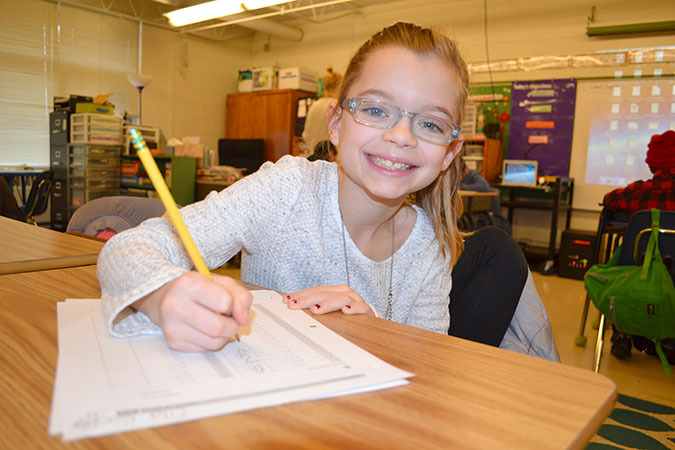 A fourth grader works through her math worksheet.